Montgomery County’s 2010 Farm Tour and Harvest Sale took place this past weekend. Of the 14 participating farms, I selected four to visit: a rescue farm that cares for retired or neglected farm animals, a family farm, a Dairy Barn, and a living history center. I had a great day and look forward to visiting these farms again – all have programs throughout the year! I started out from my usual point on Saturday mornings – Suburban Traders in Kensington. I’m hoping they’ll be on the Farm Tour next year and we can all visit the 3 acres they’ve just started farming in Olney. Fortified with a farm breakfast Kensington-style – baby swiss, roasted onions, potatoes, eggs and spicy coppa on puff pastry and a cup of coffee, I headed out to pick up my friend Marggy – taking along a Hanger Steak, Blue Cheese and Arugula sandwich and a Nut Bar for later. I figured I’d be working up an appetite despite the heat. 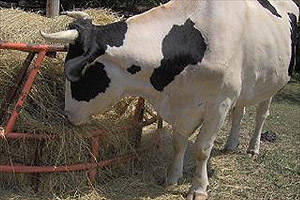 Rocky the holstein steer munches hay at Star Gazing Farm. Our first stop was Star Gazing Farm, a farm animal sanctuary. The friendly volunteer staff directed us into the farm and to the animals. We visited with Louie, a Morgan horse and Graham, a Boer goat. Pictures of the farm’s animals were posted by the staff on fences that included their ‘story’ – how they came to the farm and details about each animal. For instance, Graham is apparently an escape artist. The staff also directed us to Rocky and Bullwinkle, both Hostein steer. Bullwinkle was nowhere in sight but Rocky kept one eye on Marggy and I as he ate some hay. Star Gazing Farm is a non-profit organization supported by private donations, fundraising and services such as bunny sitting and shearing sheep, goats, alpaca and llamas for other farms. Animals at the Farm range from chickens, ducks and bunnies to pigs, goats, the steer, a horse and a donkey. The loyalty and enthusiasm of the volunteer staff is evident and for the Farm Tour many were on hand at information tables or near the animals, ready to answer questions and encourage visitors to pet the animals. This is a don’t miss when they are open to the public. You’ll enjoy your experience at Star Gazing Farm. We moved on to Lewis Orchards, which has been family owned and operated since 1888 and is open from mid-June through Thanksgiving. This is a produce farm and the busy farm market is on a hill overlooking their fields – a perfect view and setting. The farm market was filled with the bounty of summer – peaches, tomatoes, corn, string beans, onions, zucchini, eggplant, watermelon. Refrigerator cases hold locally produced milk, cream, cheese and eggs. The market – and the parking lot – was crowded. We looked at the produce – fresh, inviting, and very colorful. Marggy did some shopping, I grabbed a Birch Beer from the soda fridge and we got in line. The staff kept the line moving quickly, and we were soon back in the car and on our way. Lewis Orchards is a great destination and we will definitely return. Apple picking in the fall! How can you pass up a MOOseum? This was next on our list. In the 1950s there were more than 300 dairy farms in Montgomery County; the MOOseum is a dairy heritage museum that preserves this heritage and offers the hands-on experience of milking faux cows. Located in the South Germantown Recreational Park, the barn is up and ready for visitors! We went inside the Dairy Barn to see all things cows and dairy. Volunteers and supporters have put in 8 years of dedicated work and planning and it shows. Photographs and memorabilia line the walls of the barn, and replicas of dairy cows stand in the stalls ready for milking. On a hot day the Barn was cool(ish) and quiet. You could imagine the life of a dairy farmer on such a day, the cows in their stalls, tails flicking, a ‘moo’ here and there. Walking through the Barn, volunteers were eager to talk about the dairy heritage of the County and to encourage us to enjoy the barn and their exhibits. With much more planned for the MOOseum, this is a great stop to keep an eye on. A Grand Opening is planned for October 23, 2010! 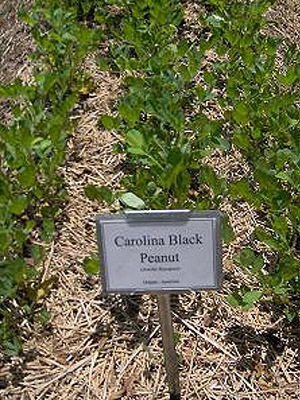 The Button Farm, located in Seneca Park and secured as a long-term lease by the Menare Foundation, is Maryland’s only living history center depicting 19th century slave plantation life. (Menare Foundation is a Bethesda Green Business Incubator company.) We drove in, parked, and walked to the Button Farm House (circa 1927) to sign in. We were greeted by Anthony who encouraged us to visit their Museum Garden filled with peppers, leeks, peas, herbs and anything else a plantation might grow for their needs. A Civil-War era Barn is on the property near the garden. We walked around the garden, down to the Barn and into the 19th century. The Button Farm holds many events during the year. Anthony says one of their best is their Fall Festival held during the first weekend in November – with demonstrations, storytelling, tours – and a cider press! Don’t miss this unique living history opportunity in Montgomery County. You’ll enjoy it immensely. All the heat and the trip to the MOOseum had us thinking of ice cream, so Marggy and I finished our trip with a stop at Sprinkles in Potomac. Although we hope the weather’s cooler next year, we’re already looking forward to this Farm Tour in 2011. It was a great day, we saw and learned a lot, really enjoyed the Tour and look forward to other events at these locations. Star Gazing Farm, the MOOseum and Button Farm all accept donations and volunteers – and Lewis Orchards always welcomes customers! Please consider visiting and supporting these Farms and the others on the Montgomery County Farm Tour. The FTC estimates that as many as 9 million Americans have their identities stolen each year. In fact, this crime may take many forms and often without any warning to you! Clean Cut Shredding, Inc. utilizes the experience gained from over 100 years of recycling solutions from its parent company Georgetown Paper Stock of Rockville, by offering the Washington area’s most complete shredding solutions. Note: Clean Cut Shredding will shred all paper into confetti-sized pieces, and then recycle the confetti into household paper products. Join us Sunday, August 15th outside of the Upstairs at Bethesda Row loading dock on Bethesda Lane (at Elm Street) from 10am and 2pm. This event will be complete with Clean Cut’s very own 27ft. truck/shredder outfitted with a monitor – so you know the job is getting done! Please note: Plastic items such as CDs and Credit Cards are not permitted. We will also have our strong and trusted volunteers from the NEW Equinox Fitness of Bethesda on hand to assist with any transporting you may need. Learn more about Equinox’s commitment to living green. Here are a few more July green events for the greater DC area–one is TONIGHT! (I forgot to include them earlier in the week.) Both take place at Community Forklift. Here’s what’s in green news this week. Optimism Reigns at Md. Green Economy Forum – State government officials and business leaders from green companies sounded upbeat about the prospects for creating and retaining more green jobs in Maryland, at the state’s first Green Economy Forum last week. The event’s centerpiece was the release of a report by the governor’s Green Jobs & Industry Task Force. The report identified six recommendations to create and retain green jobs, support clean and renewable energy, protect Maryland’s communities and preserve the state’s natural resources. Silver Spring’s NOAA a Leader in BP Oil Cleanup – Employees of the National Oceanic and Atmospheric Administration in Silver Spring have often been working 16-hour days, 7 days a week, to map the flow of oil-contaminated water, alert commercial ships of clean water routes, set up ship-cleaning stations to prevent the spread of oil and deal with the catastrophic environmental impact of the BP oil spill. Building an Ultra-efficient Car for XPrize Contest – The entry from a team of mechanics and engineers from Lynchburg, Va., reached the final round in the Progressive Automotive X Prize contest, an international competition to build the first car that can go 100 miles on a gallon of gas and at least 200 miles without refueling. Chevy Volt Will Carry 8-Year Battery Warranty – GM announced last week that the primarily electric Chevy Volt, due in showrooms this fall, will come with an 8-year, 100,000-mile battery warranty. July 24, 10 a.m.-2 p.m. – Pepco 2010 D.C. Appliance Swap: Customers can bring in old, inefficient appliances that Pepco will safely recycle at no cost to the customer. Pepco will also be handing out applications for and information about available rebates on the purchase of certain ENERGY STAR ® qualified appliances. Plus, you’ll have a chance to win a $1,000 Home Depot gift card! Location: Home Depot at 901 Rhode Island Ave., NE. July 24-25, 10 a.m. – 4 p.m. – Montgomery County’s 21st Annual Farm Tour and Harvest Sale – Spend a day or two in the country petting farm animals or having lunch by a scenic pond. Purchase fresh fruits, vegetables, flowers, plants and more. Pick your own at some farms! Visit one or more of 14 participating farms (and one vineyard)–including one farm (Button Farm Living History Center) run by a Bethesda Green Incubator organization,The Menare Foundation. July 26, 8-9:30 a.m. – Introduction to the Montgomery County Green Business Certification Program – Takes place at the BCC Chamber of Commerce, 7910 Woodmont Avenue, Suite 1204, Bethesda. The session will also cover an introduction to Bethesda Green and Montgomery College’s Sustainability Practitioner Certificate. July 29, 4-5:30 p.m. – Bethesda Green 101 – This monthly session provides the history of Bethesda Green and information about how to get involved as a volunteer or intern. Here are some of the latest green news stories and events for Bethesda and Montgomery County, Maryland. Restaurants Brace for Gulf Oil Spill Fears: Potential customers want to know if seafood is available and whether it is tainted or not, according to this article in the Montgomery Gazette. Some BP Stations See Drop in Sales Due to Oil Spill Backlash: Local station owners say anger is misplaced; some endure reduction in business up to 50 percent. AAA says sales have fallen across the nation. Grass-roots Gripes About Artificial Turf Gain Traction: After being pushed by concerned parents and environmental groups, the Montgomery County Council has asked three county agencies to conduct a study of the costs, risks and benefits of artificial turf fields versus natural grass fields. How to Conquer the Invasive Lionfish? Eat It Until It’s Gone: The relentless invasive predator is decimating coral-reef ecosystems in the Atlantic, Caribbean and Gulf of Mexico. The solution for this endangered species, according to a Washington Post story: Catch and sauté it, until it’s gone from its non-native range. Goldman, Bethesda Green Among Washington’s Green Giants: Washingtonian Magazine has a “Green Giants” online feature that includes Bethesda Green co-founder Seth Goldman. The print edition (May issue?) also mentions BG Executive Director Dave Feldman. 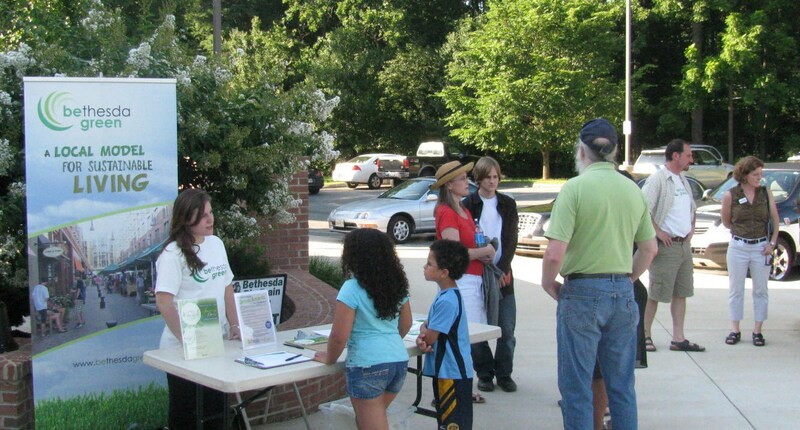 July 13, 6:30 p.m. — RePower at Home Meeting in Bethesda: Montgomery County Kick Off meeting of RePower at Home at the Bethesda Library, 7400 Arlington Rd. Learn how to make energy improvements in your home a breeze. RePower at Home explores ways to reduce home energy usage. Repower at Home is project of the Alliance for Climate Protection, a national nonprofit group. RSVP to Brenna Muller, brenna.muller (at) climateprotect.org. July 13, 7-9 p.m. — Green Night Out with Green DMV — This fundraiser for non-profit group Green DMV features Van Jones and will be hosted by NBC4’s Wendy Rieger. Green DMV promotes clean energy and green jobs in low-income communities across America as a pathway out of poverty. Takes place at the Longview Gallery, 1234 9th Street, NW. July 14, 9 a.m. – 1 p.m. — RainScapes Overview Program Class: This class will be a general overview of the RainScapes program with special emphasis to landscape contractors but all are welcome to attend to learn more about the program. Class highlights will include Rainscapes techniques design criteria, how to earn and properly fill out a Rebate application as well as an introduction into program opportunities in the Targeted Neighborhoods in the County. The class will be held at the Bethesda-Chevy Chase Regional Services Center in Bethesda at 4805 Edgemoor Lane, 2nd floor from 9am-1pm. Pre-requisite: Must have attended a previous training course to attend. To register and get info, e-mail Rainscapes.application@montgomerycountymd.gov. As the sun sloped down, the air cooled to a blissful eighty-five degrees, like a breath of fresh air, all of the members of Bethesda Green arrived at the Bethesda Big Train Baseball game. Rolling in alongside of them were the members of Dartmouth’s “Big Green Bus,” a group of ten students riding around the country on a bus fueled with restaurant grease to raise awareness for the environment. As the normal crowd for the game began to arrive, I was reminded of the lesser-known laws of physics. The fourth law states: People will gravitate toward free samples. Honest Tea, who had also joined us in reveling in the summer evening, knew this truth well. As I saw swarms of people downing different varieties of tea, from “Orange Mango Lemonade” to “Peach White Tea” it was evident that Honest Tea’s wisdom was not limited to the proverbs they place on the side of their bottles. The fifth law states: People love large shiny objects. This was the root of the popularity of the “Big Green Bus.” Even I succumbed to the siren call of seeing what was inside of the bus (which did in fact turn out to be pretty awesome). Now, I could say that I was upset over the lack of attention paid to Bethesda Green’s table. But after the hubbub of Solar Bethesda, I, along with everyone else, was relishing an evening to relax with his or her families and friends at Bethesda Green. So, although I must regrettably say that no large strides in environmental awareness were made that night, the evening did not end without its small successes. The event helped form or cement many of the friendships that will create a thriving green community that in the long term will have an enormous positive impact. In a company that is composed largely of volunteers, in a blooming industry where word of mouth is essential, everyone knows that even the smallest connections can one day lead to very large changes. This article could quite easily end here on its delightfully cheesy note. However, I would like to interject a small anecdote that has simultaneously sealed my faith in the third law of physics while also forcing me to look into the conspiratorial nature of environmental businesses. The third law of physics, for all of you who did not pay attention in science class, is: never under-estimate the selling power of a cute little kid (your science teacher might beg to differ). The anecdote begins with a conversation with Sonya’s (creator of “EverGreen Home Coffee”) nine-year-old daughter. In the span of five minutes, this little girl not only convinced me that I should drink EverGreen Home coffee, but that I also know nothing about coffee. She thereby has managed to both pull my faith from Wikipedia as the supreme center of knowledge, and has managed to do so with such a large smile that I can see no other option for my next actions. I must go and hunt for cuddly kittens and chocolate (physics laws one and two) to garner attention for Bethesda Green. The Bethesda Big Train Game might have been a few hours of respite for our company, but I promise, the next time we are all together, we are going to pack so much Adorable in our literature, that everyone will have no option but to Go Green with envy. Honest Tea, Big Green Bus, and The EverGreen Home Coffee, please bring your A game. Do you know a person, company, non-profit group or community that is doing great, green things in Montgomery County or Upper Northwest Washington, D.C.? Then nominate them for the 2010 Bethesda Magazine Green Awards! Winners will be profiled in the November/December issue of Bethesda Magazine and recognized at the Bethesda Green Gala on Oct. 7, 2010. Businesses or non-profit organizations in Montgomery County that have created an innovative green product, are selling an innovative green service, and/or are promoting a green lifestyle. Businesses or non-profit organizations that have significantly incorporated green practices into their culture and operations. Nominations accepted through July 16 by Bethesda Magazine. Let’s recognize and celebrate the businesses, non-profits, communities and individuals that are leading the local fight to protect the environment!